Midweek cup replays. I don’t expect Ki to play much if at all and hopefully Son also gets a rest. Also a goal from Ji who looked good down in BL2. Ki Sung Yueng — A shift in tactics again, with Ki back to a DM pair with Fer. Defensively, there were a lot of gaps in Swansea’s with fatigue from the Arsenal upset midweek looking to cause some slowness. But Swansea were able to battle back and do just enough to earn a nice away point. Ki provided the assist with a very good corner, and had a few other nice set pieces and passes too but was as guilty as anyone else of looking a bit tired. With DM depth strained with Sanches hurt and Fer done for season, we’ll see if Ki is forced to play out of lack of warm bodies but one would think that Carvalho would protect and rest his best DM. Suk Hyun Jun — I think still out injured but their match this weekend was cancelled due to all the flooding in the region. Kwon Chang Hoon — Match cancelled. Koo Ja Cheol — Playing between a CAM and second striker who also drifted deeper, Koo had one of his best games of the season, with some great dribbles and touches leading to many opportunities and scoring a great goal, shooting against the grain into far corner. Again, more like last season, shifted into a strict DM role partially through second half and did ok there but without any real pressure. A very good showing and helps Baum deal with Finnbogason’s injury so I expect more of the same going forward. Lee Chung Yong — He must be furious about warming bench and not being used despite only one sub used all match by Hodgson. If hes’ not going to be used, why not use an academy kid or something? Or just a warm blanket? Lee Seung Woo — He went on with 20 minutes to go. I was so not expecting this that I didn’t check to see if he was playing even though I was awake. He looked ok in touch video, even if a bit of a boy among men physically and lacking any chemistry with his teammates who stopped every potential give-n-go. Tavern Owner back – since it’s Tuesday we have an update for you: Ki came onto the 2nd half of a Swansea demolition of Notts County – an absurd 8:1 win to advance in the FA Cup. Ki also managed last weekend to knock down another long standing Park Ji-Sung’s record – as the Korean footballer with THE most Premier League appearances. We’ll get to Koo’s goal – a really nifty one at that but first, his teammate Ji Dong-Won (on loan for the season) scored his first with Darmstadt. It was a 37th minute equalizer. Unfortunately Darmestadt would go on to lose 1:2. They are mired in 16th in the 2.Bundesliga table. Watch Koo Ja-Cheol score with flair, nutmegging Eintract Frankfurt’s Falette in the process. It’s his 2nd goal of the season, this a few weeks after scoring the only goal in a game against Hamburg in January. They weren’t the only ones interviewing Son, Thierry Henry interviewed him before the Liverpool clash for SkySports. Apparently Henry has been keeping a keen eye on Son and it turns out to be a pretty surreal and fun interview. Yow! And lastly, not to act like some kind of paparazzi, but to act like the paparazzi, here’s Son and Alli in a private jet to shoot a promo, presumably for Adidas. They flew off after the Liverpool match. They might be in action tomorrow for the FA Cup replay against Newport County at Wembley. Still here? Shin Tae-Yong and a K-League-ish version of the KNT ended their January training camp with a tepid 1-0 win over Latvia on Saturday. Other than a multitude of wasted opportunities – one after another – Kim Shin-Wook of course scored with his head to nab the meager result. For all the non-FIFA regulated friendlies during the camp, he scored all 4 Korean goals (1 against Moldova and 2 on Jamaica). We didn’t exactly learn much, Lee Jae-Sung looked lively as usual – the Wookie can score but is a bit of a lumbering version of Peter Crouch, and Jang Hyun-Su is defensively a huge liability (and yet still gets called up to lead the backline). The long lasting worrying signs: Shin Tae-Yong will be tempted to install the Wookie up front in the World Cup. Don’t get me wrong, having a tall giant can be effective at times, and certainly Kim has been and will continue to be an asset for his club in Jeonbuk. But against the likes of Sweden, Mexico and Germany, if Shin Tae-Yong pulls that Wookie trigger into action, it has all the hallmarks of the agonizing stilted tactics of long ball desperation. Anyway, for another POV on the January training camp, K-League United has a good summary that can catch you up, check that out here. Congratulations are in order for Ki! When I saw that he broke Park JS’s Korean PL appearances record, I was a bit surprised because it feels like Ki has flown under the radar. He had that breakout season 2014-14, but, since then, he’s been relatively quiet. But cheers to him for putting in the work and consistently racking up appearances. Granted this record was set with a lower profile club compared to Man United, it’s still an impressive feat! Let’s hope Son gets a crack at the record himself (which depends on the usual factors—form and health—but also military service for him, as of now). I also agree with the sentiments echoed in the comments section of a recent Tavern post: don’t be fooled by the Wookie’s latest scoring run! His scoring steak does not carry over against stronger opposition. I would much rather our attack flow through Ki, Koo, Kwon, Lee JS, Son, Hwang, maybe Suk or Ji, than Kim SW! Completely random note. 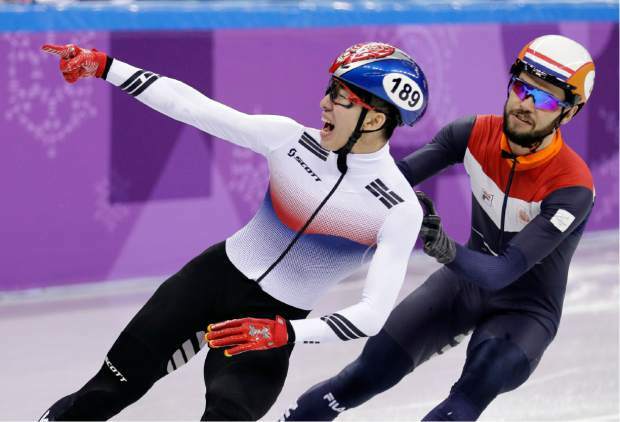 I think the design for Korea’s short track outfit is awesome. Koreans generally have great fashion, so I’ve always been surprised that the Korean soccer shirts are awful. Why doesn’t Korea use the same designer, or better yet, they should have the exact same design because it’s awesome. I’m not a fashion snob, but look at the history of the Korean shirt. At best, it’s blah, at worst, it’s tacky as hell. I always felt like you guys should do a post about the kit history of Korea. Since the World Cup is coming up, why not now…?